I wrote a while back about the Status Quo Effect and how puny humans are likely to stick with a default or pre-selected option when presented with multiple choices. It’s why e-mail subscription opt-outs are more “successful” than opt-ins, and it’s how services gently steer new customers towards the more profitable options like annual subscription instead of monthly ones. Personally I think they should have had one type of charity associated with different types of Civ victory: science, culture, military annihilation. 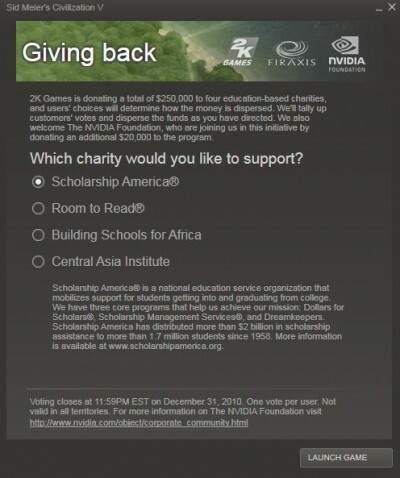 2K Games is giving away a wad of cash to the charity that gets the most votes from Civ 5 players. Pretty awesome, but it occurs to me that the first charity, Scholarship America, kind of has an unfair advantage over the others because it’s not only listed first, but selected by default. Because of the status quo bias, a lot of people probably just left it selected and hit “Launch Game” without thinking much about it. 1 If Firaxis wanted a more pure measure of user preferences, they’d make none of the charities selected by default and make players select one before they could proceed. This got me thinking of somewhere I had also seen player voting in another context: Halo Reach’s matchmaking lobbies. When you and a lobby full of other players in Halo: Reach get ready to start a new game, you’re presented with three choices with different maps and game modes, plus a “None of the above” option. Players get to cast a vote on which they prefer. Also, you get to call other people terrible names for not voting the way you want. But besides the homophobia, one important difference between Civilization V’s charity voting and Reach’s game selection is that Reach doesn’t have a default option selected or flagged for selection. So the status quo bias isn’t at work there. It’s possible, though, that the first person to cast a vote gets to influence the voting of others by creating a de facto default vote. 1. Unless, of course, my sample of 1 data point is insufficient to see that Firaxis is doing something clever, like randomizing which charity is listed first and thus selected by default. As in your footnote, your first example is assuming too much. I’ve done several installs of Civ 5 now. With 3 points of data available (I’m counting yours b/c Scholarship America was not first on either of my installs), I’m calling it for “random”. Possibly it could be an actual weighted distribution of some sort as well, if for example, one of the charities sent much nicer return address stickers with super-cute puppy dog illustrations, and thus biased the list in their favor. I’d like to second neshura. I’ve done two installs of Civ5 and had different defaults / first choice on both counts. This does beg the question though, does my vote get counted twice? Does the second cancel out the first? Funny, I was thinking the same thing when I was installing Civ. I wonder, with something selected by default, if the randomization allowed for an even distribution of options being initially selected, does it produce more evenly distributed votes then if the player was forced to select something? It would be interesting if the need to select something actually convinced more people to take a closer look at the options. It would probably be a rather simple study to do, too. They used the same “default option” thinking when they made the National Broadband Network rollout in Tasmania opt-out rather than opt-in. Legality and morality and sensibility aside, it’s a savvy way to ensure the support of the apathetic. There’s actually a default option in Halo Reach during the voting screen. If you notice, one of the three options has a little arrow by it. If there is a tie in voting, the game will default to that option. I assume that it would also be the default if no one voted.